Oh, Pool Boy, calls Euka. I’m still waiting for that Mojito. Our sassy diva has that look of practiced impatience. Peering over the top of her stylin’ shades, she is using her wiles to get others to do her bidding. Or so it appears to me, anyway. What d’ya think? Any photo caption ideas? Drop your inspired thoughts in the comments, won’t you? And if you’re a fellow blogger, be sure to put a link to your site in your comment. Terrible at captions, but what a great dog and setting! What do yo mean we have to leave? I am staying! my future's so bright, I gotta wear shades! How 'bout we replace Mojito with Belly Rub? That's still in the Diva-ish realm, isn't it? And because Euka's of the canine variety, it's not really naughty. Thanks for stopping by and the kind words, Emma! Happy WW to you. A week just wasn't long enough here, I agree. Euka does have her stubborn face on, too. We're familiar with that look. Happy WW to ya, Sugar. Euka says to tell you *kiss kiss*. Great quote; you know it's true! The girl has a destiny, right? Hugs to you, Mary. We sure do miss you. I can't think of a caption, but I love Mary's caption as that is so perfect for Euka. I'm so fortunate to have a CCI dog myself. Hi Robbie, thanks so much for stopping by. I love your blog btw; dropped a link in the blog roll on the right. Euka is still trying to get past that base tan. I tell her that pale is the new tan now, but she insists on being a sun goddess. 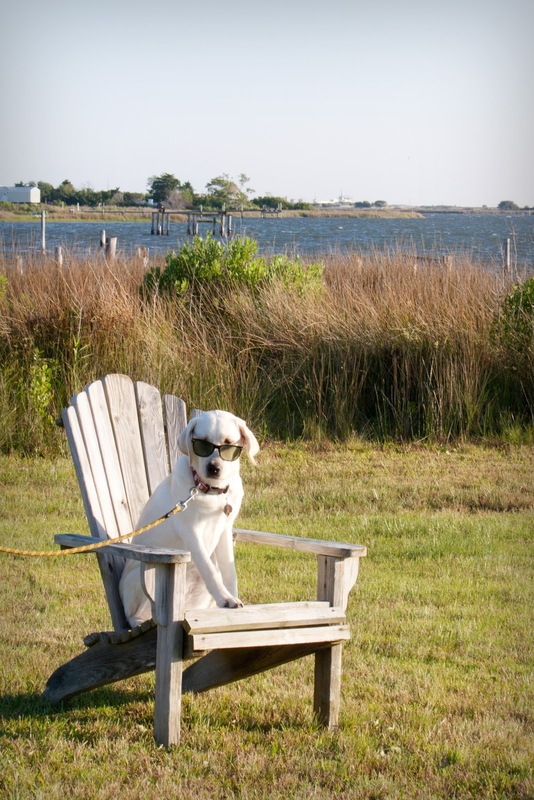 There she is, posed with one paw forward and peering over those shades. Oh my, is that her come hither look? Is this what it feels like to be the mother of a teen girl? And as if she would move. Not happening, I don't think. Thanks for stopping by on WW! And maybe for the princess to get out of the lawn chair so we can enjoy it too? It was gorgeous there and we were just blessed with wonderful weather. Oh Pup Fan, why does that give me pause? There was a good-looking black lab that strolled across the backyard one morning and I was all “put Euka in the house before she sees that dog.” Like I was afraid she'd put on a halter top and jump on his Harley. This is why I usually raise male puppies for CCI. Mmmm, mojitos. That does sound fine, doesn't it? Thanks for stopping by on WW! Hi Jenny, welcome to our dog blog. I've gotcha in the puppy raiser blog roll on the right. Now about that mojito. An adult beverage that just hits the spot on a summer's day. The only time I partaked in this particular cocktail was when dining on the outdoor patio at a Turkish restaurant on a warm evening. So my view of the thing is a bit romanticized. According to Wikipedia, my go-to source, this is a Cuban highball made with white rum, sugar, lime juice, sparkling water and mint. And as I read that second paragraph again, it may sound as if I went to Turkey to get a drink. Naw, it was in Dayton. And so with one word I just sucked the whole romance thing right out of this, didn't I?